By Meg Anderson. Story can also be viewed as an interactive story map. Cabrini Green occupied 65 acres of the Near North Side for seven decades. 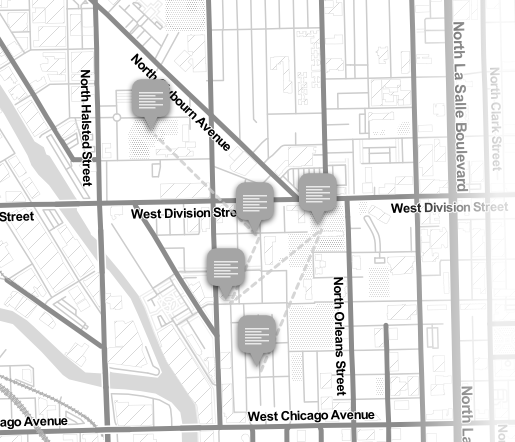 Click for interactive map to walk through the neighborhood. In the 20 years since the demolition of the Cabrini Green complex began, much of the area it occupied has been developed, but the sites of many of the high-rises remain vacant. The pressing question has been what to do with this land, and the Chicago Housing Authority now has an answer. It came this spring in the form of a Development Zone Plan, which proposes the construction of 2,330 to 2,830 mixed-income residential units, a third of which will be public housing. There are already 580 public housing units spread throughout the neighborhood’s apartment buildings. With the new plan, that number will rise to at least 1,357 public housing units, according to CHA Development Manager Kathy Caisley. Proposals for construction will start coming in this summer. The new plan offers just over a third of the 3,600 public housing units that Cabrini-Green offered – meaning many who had lived here won’t be able to come home again. Cabrini Green occupied 65 acres of the Near North Side for seven decades. It was a place where children learned to drop to the ground at the sound of gunfire. At its peak, 15,000 people – mostly low-income, African-Americans – called it home. In 1993, only one in 10 apartments housed someone who was employed. The Frances Cabrini Row Homes, named for the first American saint, were built in 1941 with good intentions in an effort to improve the neighborhood known first as “Little Sicily” and later as “Little Hell.” In 1934, the Chicago Daily News reported that the area’s crime rate soared 12 times higher than the rest of the city. 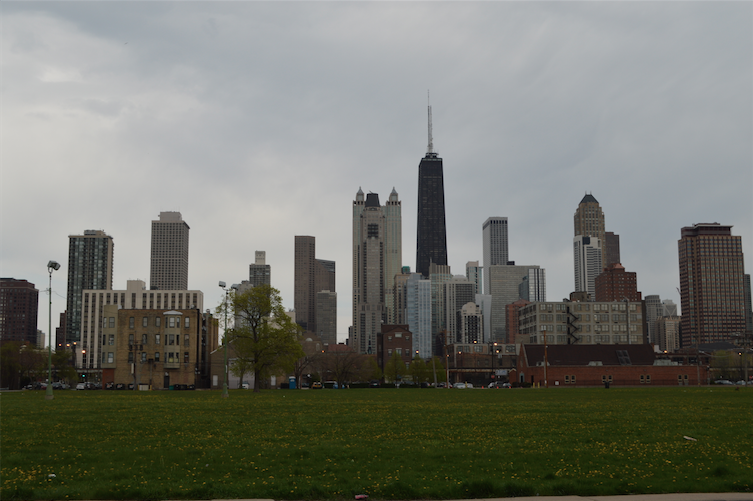 Chicago’s skyscrapers stand tall in contrast to the vacant lot along North Hudson Avenue. In the new plan, CHA has recommended low-density residential buildings to fill this lot by 2023. Although Cabrini Green remained troubled until its demolition, many former residents still think of it fondly despite its hardships. A walk through the neighborhood in search of what the wrecking ball left behind reveals the complicated legacy Cabrini holds for those who called it home. Lisa Springfield curled up on her loveseat in the Cabrini row house she has lived in for over 20 years, watching her two daughters browse Beyoncé music videos on YouTube. Nearby, her three-year-old grandson bounced restlessly around the apartment. As she watched her family, she remarked how peaceful her neighborhood has been with Cabrini Green gone. Springfield lives on the western edge of the Frances Cabrini Row Homes, in a line of three-story, yellow-brick apartments refurbished by the city. To the east, the row homes are abandoned, with blackened plywood blocking the windows and loose wires dangling off the roofs. The row homes are all that remain of Cabrini Green. The row houses, which are eligible for the National Historic Registry, will remain untouched for now, due to a lawsuit against the CHA. Former residents sued, saying the homes they left in 2008 were supposed to be refurbished for their return. The buildings have been vacant ever since. Once the lawsuit is settled, it is possible the buildings could be demolished, pending a review for historic preservation. 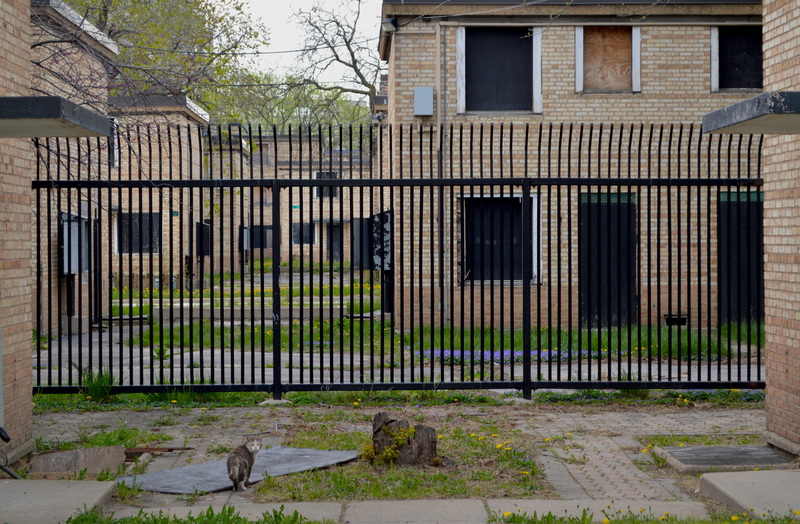 A cat explores the abandoned courtyards of the Frances Cabrini Row Homes along North Hudson Avenue. The row homes will remain vacant until a lawsuit between former residents and CHA has been settled. In Springfield’s row house, the noise of shouting came from the courtyard. She stretched over the back of her couch to peer through the blinds. Two men ran past with hats shading their eyes from the afternoon sun. They looked over their shoulders at police officers not far behind. Springfield said she doesn’t see this kind of excitement often anymore. Though crime remained a problem, Springfield said many friends who left wish they had stayed. They say conditions are worse in their new neighborhoods. As she turned away, her grandson darted to the couch. “Boo! Boo! Boo!” He shouted. After a wide-eyed pause, he added: “I gotta get more bullets,” then scampered away. 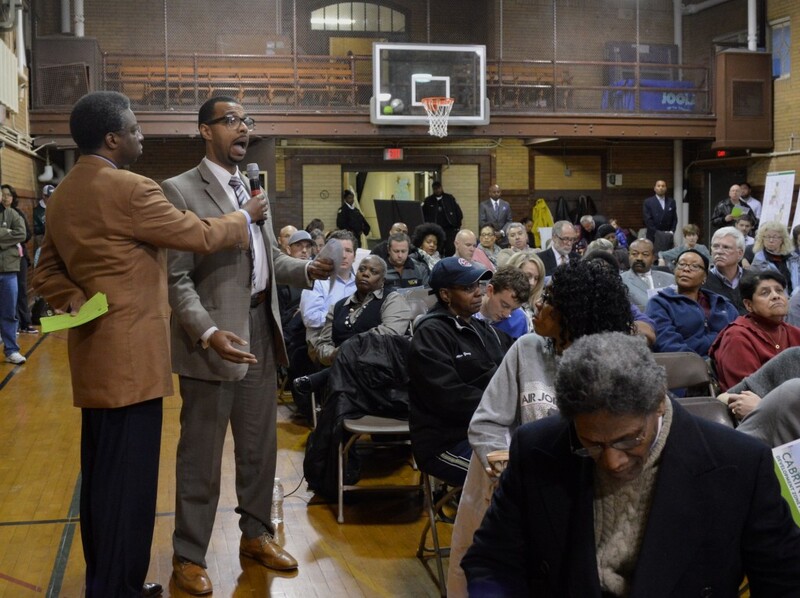 On April 22, Near North residents packed the Seward Park gymnasium to see a pre-recorded presentation of the new development plan. 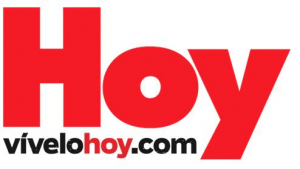 The plan focuses on establishing residential and commercial development over the next decade. It would create retail corridors on Division Street and Clybourn Avenue, add low- and mid-rise units near the row houses, and provide youth and employment services throughout. The proposed buildings will be one-third public housing, one-third affordable housing and one-third market rate. When the original buildings were torn down, CHA made a list of people who wanted to come back. They reach out regularly to see if those people still want to return, said Caisley, who said she was unsure of the number of people on that list. Jenner Academy of the Arts Principal Robert Croston speaks about his school’s under-enrollment at a Chicago Housing Authority community meeting April 22. At the Seward Park gymnasium, Robert Croston, 31, sat on the aisle, writing quickly on a comment card. In August, he became the principal at Jenner Elementary, located next to Seward Park. He said the school can serve 900 students, but only 240 are enrolled. Its third floor is nearly abandoned. “More families are moving in and just not choosing our school,” Croston said. “A plan made for deliberate integration is causing segregation,” he added, referring to the development plan. In 1999, Jenner was rebuilt a few blocks north of its former location but the school is struggling to reinvent its image. In 1992, seven-year-old Dantrell Davis was shot by a sniper steps from Jenner’s doors, on his way to school with his mother. The senselessness of his death shocked the nation. Minnie Long, 75, sat across from Croston on the crowded basketball court, listening as community members raised concerns that the plan leaves out former Cabrini-Green residents. Long has lived in the neighborhood all her life. Long said Cabrini Green’s image worsened after the 1970 deaths of two policemen, shot from a sixth floor window of a building across the street from Seward Park. Afterward, “Every time they mentioned our community, it was gang bangers this and gang bangers that,” Long said. “When you’re born and raised in a place, you’re concerned about what’s happening,” Long said. The day after the community meeting, Jim Fogarty stood at Cambridge Avenue and Hobbie Street, looking at the empty lots on three of the intersection’s corners. The high-rises, where Fogarty worked for over 20 years, occupied these lots. Since 1987, he has been walking Cabrini-Green to promote peace among gangs, an act that has been met with mixed reception from residents. Known as “Brother Jim,” Fogarty is now the only active member of Brothers and Sisters of Love, a Catholic ministry he started with the now-retired Brother Bill Tomes. Fogarty, tall and lanky with messy gray hair, was dressed in jeans and a White Sox sweatshirt, a departure from his usual tattered denim habit. Fogarty, 57, said the high-rises centralized the gangs. Each building was “owned” by a different gang and it was clear who was in charge. Fogarty said it’s harder now to find the bosses responsible for ordering the violence. After Cabrini Green was demolished, he said, gang violence spread across the city, creating a wild-west environment where no one could be held accountable. After the high-rises fell, crime rose in the neighborhoods where families relocated, according to a 2012 Urban Institute study. 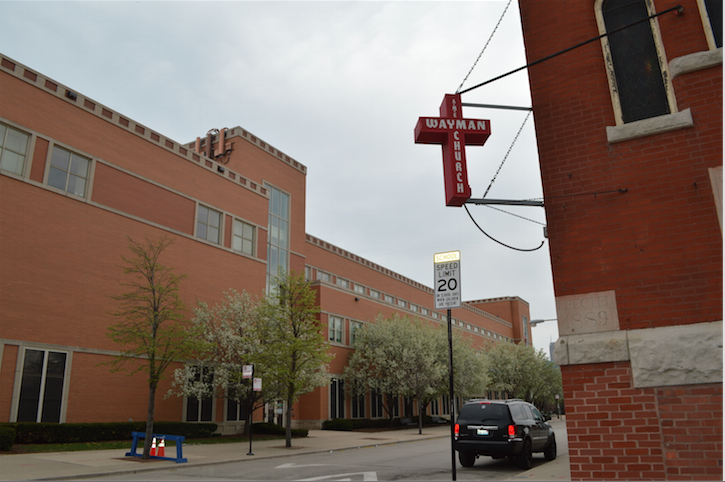 The Wayman AME Church, where the congregation is shrinking, sits across the street from under-enrolled Jenner Academy of the Arts. Across Cleveland Street from the new Jenner school is the Wayman African Methodist Episcopal Church, a 126-year-old brick building with a red cross hanging diagonally on its corner. On the Sunday after the community meeting, about 30 members gathered for worship. Reverend Clinton E. Ward III led gospel hymns in front of a semi-circle of pews, as sunlight seeped through the muted stained glass windows. Bernice Thompson sat in the back, wearing a matching crisp white skirt and blazer, a bright yellow scarf, and a wide-brimmed white straw hat. Thompson has attended Wayman for 58 years and has watched the congregation dwindle along with the decline of the neighborhood’s African-American population. Before retiring in 2007, Thompson worked in five of the eight William Green buildings as a community representative for Schiller Elementary School, which closed in 2009. She described herself as an “underpaid social worker,” visiting homes to keep kids in school. “Everyone knew me and knew I would help if I could. 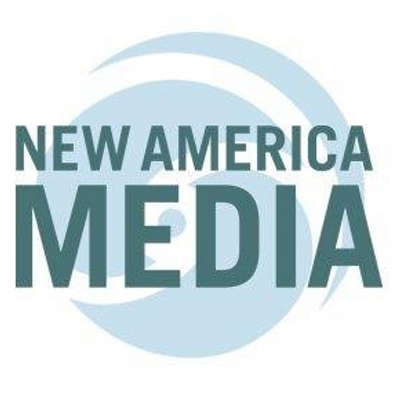 I would give them money out of my pocket if they needed Pampers,” said Thompson, who said she took a group of children to Disney World after Dantrell Davis’ death to show them another part of the world. Thompson said the gangs protected her. If things got too dangerous, they would warn her to stay away for a while. Thompson said the confined nature of the high-rises made it easy to provide social services and build relationships with families, but many of the families she knew have left the neighborhood. “They are all over the place. They’re not going to come back. It’s like family. Everybody knew everyone. It hurts me,” Thompson said. At Wayman, Thompson knew all the songs by heart. The other churchgoers were on their feet, clapping and swaying, but she stayed seated to rest her surgery-scarred knees. When it was time for communion, the others walked to the front to kneel at the altar. Thompson rose and instead slowly made her way to sit in the front row beside an old friend, one of the last remaining of those she came to know as family. Directly east of Thompson’s former school, Schiller, is the Stanton Park Natatorium where sports instructor Johnny Payton spends his days. Payton, 34, grew up in a Cabrini Green apartment with his mother, father and eight siblings. He is a towering presence at nearly six foot five, so it’s not hard to imagine he’s good at every sport he plays. Payton, a father of three, considers himself a role model for the kids he coaches. He said his first mission is to change the kids’ perceptions of where they’re from. “Just because it’s a project, doesn’t mean that it’s bad,” Payton said. Payton said sports, especially baseball, had a unifying effect for the children who lived in Cabrini. In the early ’90s, the Near North Little League, with about 450 kids, rostered players according to gang affiliation to avoid conflict. But on the field, they overcame their differences. “The sport was bigger than us. It was about fun,” said Payton, who said he never joined a gang, calling them overrated. Payton’s finest memory as a pitcher was when he struck out the two best hitters of an undefeated rival team to win the league championship. A few years later in 1995, the same year the demolition of Cabrini Green began, the field was paved over for a new shopping center. “They literally took away home,” Payton said. “When the buildings started coming down, no one thought it was a big deal, but then people started realizing that this was going to be for real,” said Payton, whose building was the first to go. His family relocated to Chicago’s West Side, but returned a few years later to live in a Green building next to Stanton Park. Payton now lives on the South Side, but commutes back to coach at Stanton Park, Seward Park and the Jesse White Community Center, all of which will remain unchanged or be expanded in the new plan. At the end of his shift, Payton walked toward the east-facing doors of the natatorium to his car. Outside, he passed through the grassy field where his home once stood.